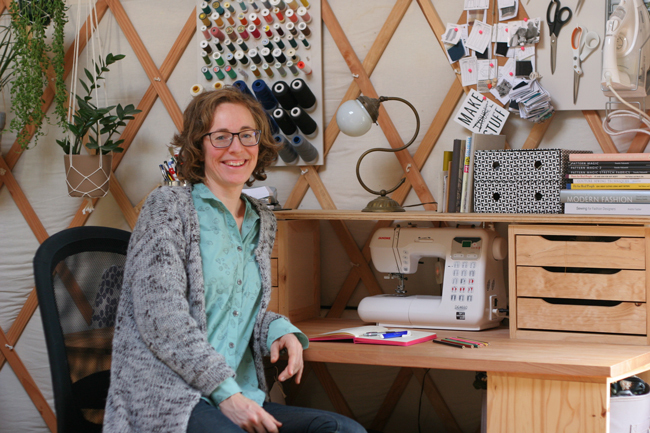 Tilly and the Buttons: Sewing Space Tours... Lisa's Yurt! 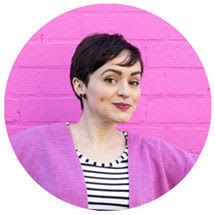 Hi, I’m Lisa and I’m happy to give you a tour of my sewing space! It is my first ever dedicated sewing space and I designed it myself, so I’m pretty proud of it. 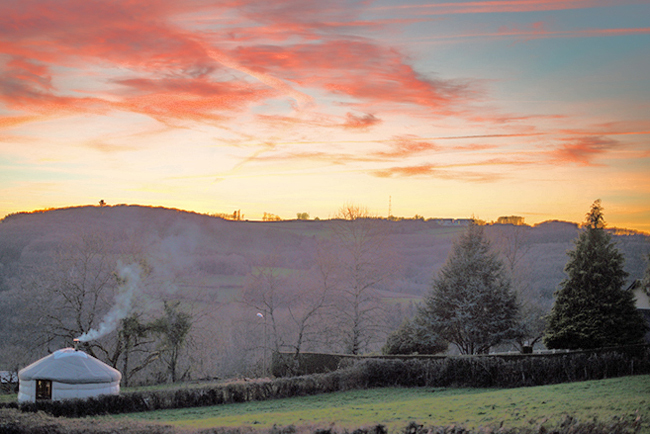 I live in Burgundy, France. I’m originally from the Netherlands but we decided to settle here after travelling for a year. We wanted to try it out a bit before we bought anything, so we built a yurt to live in. 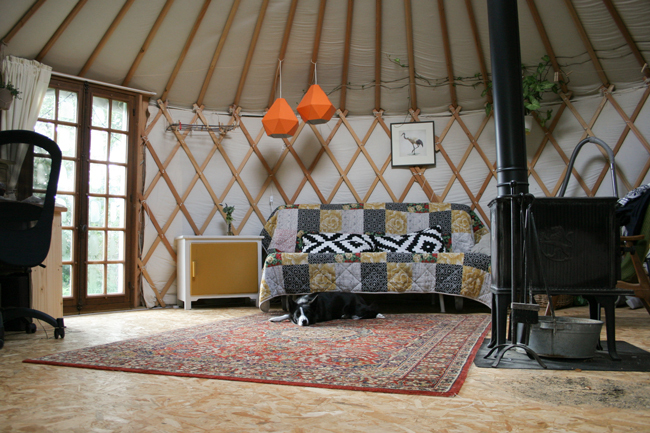 Yurts provide enough living space for us, they’re relatively cheap to build and they’re not permanent. They can be taken down in a day if need be, without leaving a trace. For us it’s perfect because we don’t know exactly where we want to live yet, and in the mean time we still have a comfortable place of our own. 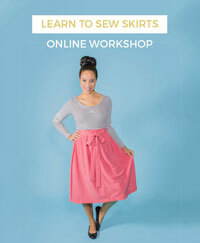 When it comes to sewing, I sew almost all of my clothes. It started as a one year challenge and after that I just kept going. It was a great experience, your learning curve is so steep if you do something almost daily. My style is somewhat practical (I love to sew with knits) but I don’t want it to be boring so I try to keep it original. I also sew a lot of samples for my designs since I’ve started Paprika Patterns, which sometimes leaves little room for sewing anything else. I don’t have particular sewing rituals. except that I usually try to take a whole day to cut out some projects. After that I can just start sewing whenever I feel like it. I like to make myself a cup of tea when I sew too, but it just gets cold really because I get so engrossed in sewing. I take a break for coffee, because cold tea is alright, but I like my coffee hot! 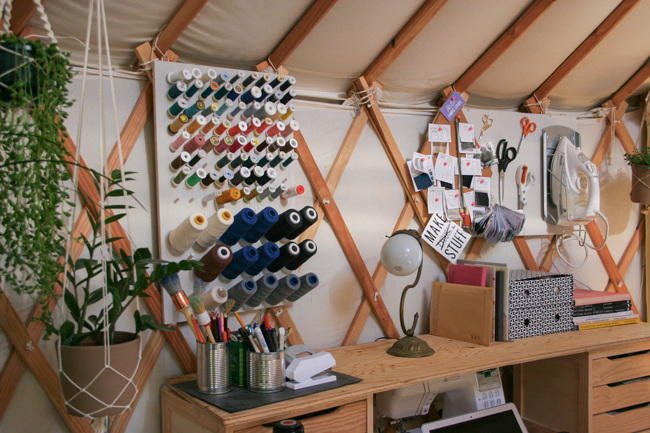 A yurt is round and it is a single room, so to sew and work I have created a kind of multifunctional desk instead of a room or corner. I had to keep it as compact as possible because we only have 28 metres square. My stuff still takes over the rest of the house sometimes, sewing can be messy! Because sewing is also part of my work, I can justify taking up a chunk of space. I chose the place next to the window because I need the light. It’s wonderful to look up and gaze out of the window every now and then. I share the yurt with my husband and our dog. Fortunately sewing doesn't make much noise, so they’re not bothered by it! I’ve designed my desk in such a way that it can hold most of my fabric, notions, WIP’s, machines and my inspiration board. We do have a house 50m away that we can use, and some of my fabric is stored there. I also cut my fabric in the house because there’s a large table. My desk is half bought, half made by me. It’s basically just two cabinets with a table top on top. I bought the first cabinet, and then figured that I could make it myself for half the price, so that’s what I did for the other one. The table top is one from IKEA, a light colour so I can also use it to shoot a tutorial if needed. The cabinets give me a lot of storage: 6 boxes hold fabric, one space is for patterns and one is for my serger. I rounded the long sides of the table so it follows the curve of the yurt and provides more ‘breathing space’ when I work. The cabinets hold various small things: zippers, buttons, bias tape, needles, stationary and other craft stuff. On top is the stuff I use most, for easy access: pens, rulers, seam allowance guide and such. 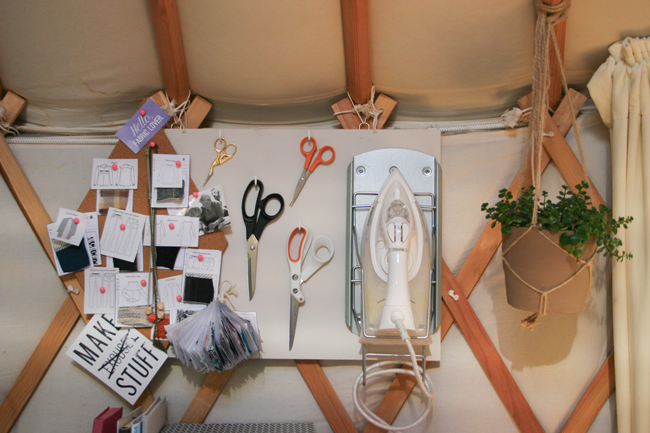 The thread rack and the inspiration board I made myself too. It frees up a lot of drawer space, plus I love how it looks! The other board I made to hang stuff on the wall without drilling holes in the yurt frame. The iron stand is super convenient (IKEA again) and I can easily grab a pair of scissors. 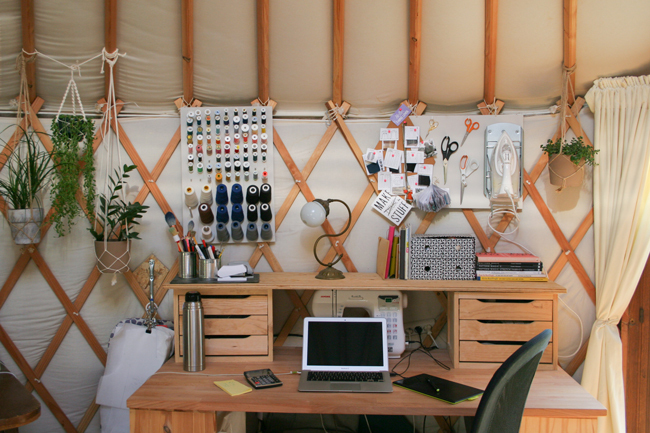 I love the diamond shaped cork board, it mimics the shape of the wooden yurt frame and now I have a project board too. My machine is stored under the top board when I’m working on my computer. When I need to sew I just slide it out and turn it on, it’s always plugged in. 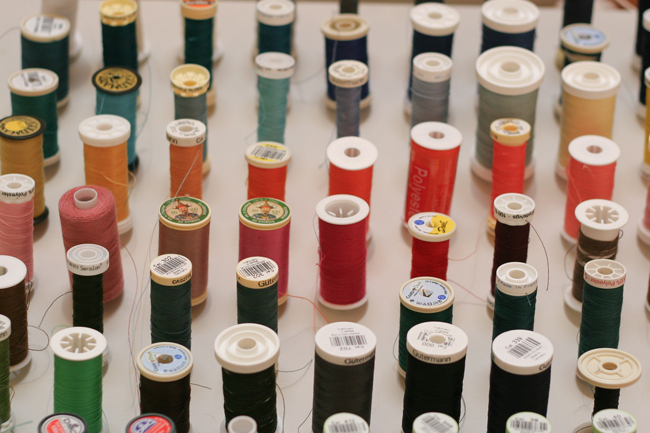 I have enough space to sew like this. My iron sits on the top board when I’m using it. The little ironing board is very handy, I just have it standing next to me on the floor. When I’m sewing and I need to press a seam, I just put it on the desk, then put it on the floor again when I’m done. I like not having to get up and iron somewhere else. Another thing I made is the WIP hanger. It’s just a piece of wood with a hook screwed to it, made in such a way that it fits into the frame without nails or screws. I also hang my ironing board here when I’m not sewing. Because my fabric is in boxes and I have quite a lot of it, I’ve catalogued every piece on a card. Every card says what the content is, the length and width and has a small sample. I absolutely love to browse through the cards to pick out my next project. I helps me keep my stash in control (well, sort of…) because I can easily see what I have and there are no ‘forgotten’ pieces. 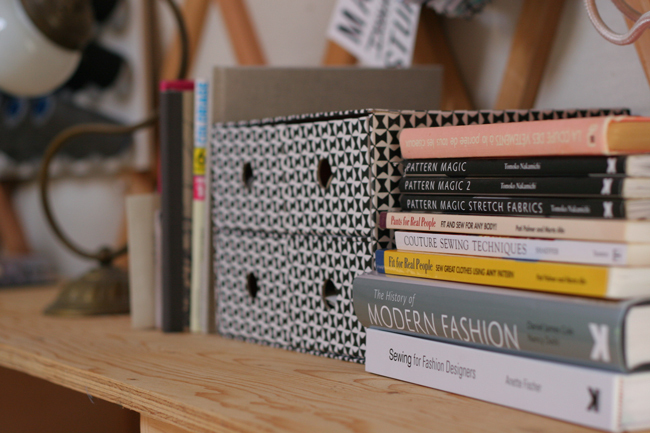 I’ve written a series of posts on cataloguing your stash and why it’s great for your creativity. It’s a bit of work to do it, but it’s really worth it. I hope you liked this peek into my ‘corner’! 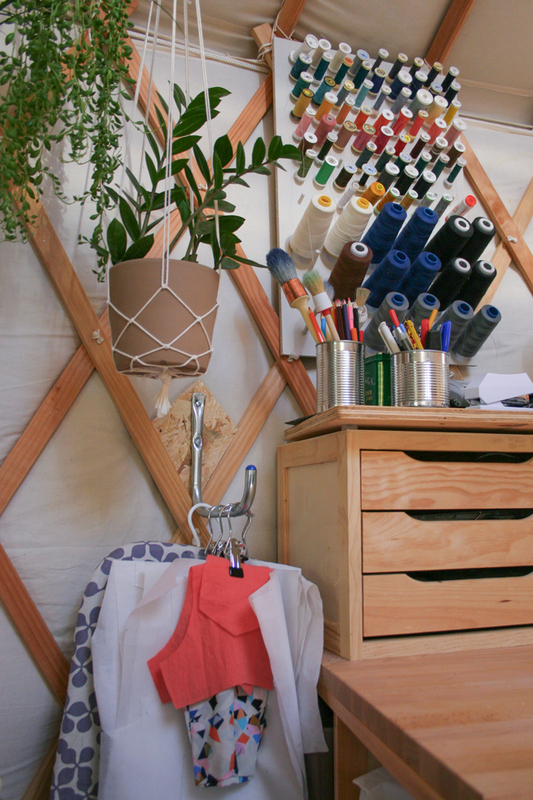 Fancy having your sewing space featured on our blog? Find out how to submit in this post. We look forward to sharing more of your inspiring spaces!